Soft contact lenses are considerably more popular than rigid contact lenses, especially silicone hydrogel soft contact lenses since they allow a lot of oxygen to reach the cornea. In 2014, 68% of contact lens fittings in the United States were for silicone hydrogel soft contact lenses. 24% of fittings were for other types of soft contact lenses, 6% of fittings were for rigid contact lenses and roughly 1% of fittings were for hybrid soft-rigid contact lenses. Among the contacts worn only for aesthetic reasons, such as plano colored contact lenses and plano special-effects contact lenses, almost all lenses available on the market are soft lenses. One reason for this is that soft lenses tend to be more comfortable – especially for an eye that isn’t used to wearing lenses. When there isn’t a special visual impairment to take into account that can only be corrected with a rigid lens, most people opt for soft contacts. It should also be noted that soft lenses can be used to correct most (but not all) of the commonly occurring vision problems, so wanting colored or FX-lenses that also offers correction is usually not a hinder against using soft lenses. 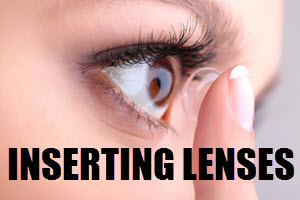 Through the centuries, various scientist have experimented with glass contact lenses, but these types of lenses have been scientific curiosities rather than something you would be okay with wearing in your everyday life. 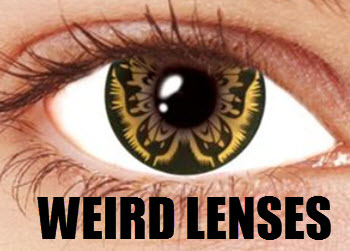 It wasn’t until the invention of lenses made from polymethyl methacrylate (PMMA or Perspex/Plexiglas) that contact lenses turned into a fairly popular visual aid. A serious problem with the polymethyl methacrylate contact lenses was that no oxygen could reach the cornea through the lens. Since this was a serious health risks for the eye, a lot of effort was put into the development of contact lenses that would allow oxygen through. In the late 1970s, rigid materials that would allow oxygen to come through were created. Contact lenses made from such materials are known as rigid gas permeable (RGP) lenses. Rigid contact lenses are less common today now that soft lenses are available, but they do have their advantages. A rigid lens can for instance replace the natural shape of the cornea with a new refracting surface. One situation where this comes in handy is when you want to correct for astigmatism. 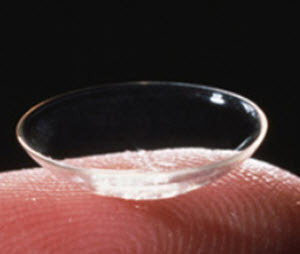 Rigid contact lenses are also used to correct corneal irregularities such as keratoconus. Since soft contact lenses are less chemically inert than rigid ones, rigid contact lenses are a better option for certain challenging environmental conditions. A downside with rigid contact lenses is that they normally require a period of adaptation in the eye before the wearer feels comfortable with them. The soft contact lens was invented by the Czech chemist Otto Wichterle (1913 – 1998) in Czechoslovakia in 1961. One of the big advantages with the soft contact lens is that it is relatively comfortable for the wearer even directly after insertion, as opposed to rigid contact lenses that tend to be quite uncomfortable until they eye has adapted to them. 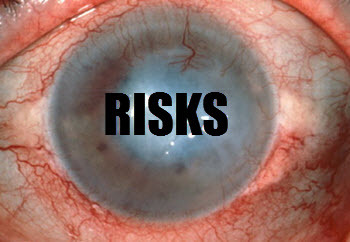 Unlike a rigid contact lens, a soft contact lens can not change the shape of the eye. Modern soft contact lenses made from polymers offer great oxygen permeability and lens wetability. In 1998, silicone hydrogels became available. Silicone hydrogel contact lenses offer the best from two worlds. 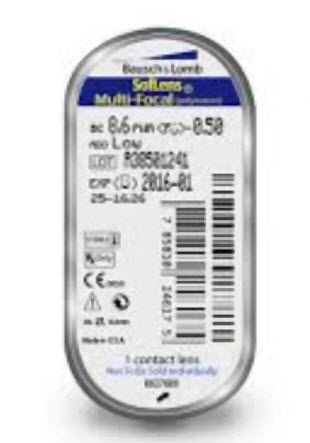 They come with the comfort and clinical performance associated with standard hydrogel contacts, while also sporting the very high oxygen permeability of silicone. Silicone has a higher oxygen permeability than water. A downside with the early silicone hydrogel contact lenses was that they were somewhat stiffer than classic hydrogel lenses. The lense surface could also be hydrophobic, i.e. not very wettable. Today, new manufacturing techniques for silicone hydrogel contacts have minimized these problems. The advent of silicone hydrogels made it possible to create contact lenses that are approved for use overnight. In the late 1950s, Professor Otto Wichterle was appointed director for the newly created Institute of Macromolecular Chemistry of the Czechoslovak Academy of Sciences (CSAS). While the building for the new institute was being constructed, Wichterle conducted experiments with hydrogels in his own home. On Christmas afternoon in 1961, Otto Wichterle produced four hydrogel contact lenses in his kitchen, aided by his wife Linda. This was the first soft contact lenses ever created. The Wichterles used a home-made machine that Otto had built using a bell transformer, a bicycle dynamo borrowed from one of his sons, and a children’s Merkur building kit. The machine also used moulds and glass tubing made by him. Otto Wichterle tried the newly made contact lenses in his own eyes and noticed how comfortable they were (although, unsurprisingly, they were not the right power for him). His next step was to develop a centrifugal casting procedure that could be used to manufacture soft contact lenses. After just a few days, Wichterle had completed a patent application and created over a hundred soft contact lenses. Wichterle built several improved machines using Merkur building kits, but they featured an increasing numbers of spindles which meant that they needed a stronger motor, so Wichterle had to take the motor out of his gramophone and use that one for the contact lens production. In the first four months of 1962, the Wichterles made 5,500 soft contact lenses. Eventually, SPOFA (a state enterprise) started manufacturing soft contact lenses under the name Spofalens. A hybrid soft-rigid contact lens will typically have a rigid center surrounded by softer material. Another available hybrid is the one where a small rigid lens is attached to the surface of a larger soft lens. Hybrid soft-rigid contact lenses are very unusual and few manufacturers offer them. The goal of a hybrid lens is to provide a correction that only rigid lenses can give while simultaneously offering the comfort associated with soft contact lenses.